LUKE POWELL was born in Suffolk in 1959. When he was eight the family moved aboard an old fishing boat on the River Deben, in which they later sailed to Greece where the boat earned a rather fitful living doing charter work. Much of Luke’s childhood and adolescence was spent on the island of Spetses, and by the age of 16 he was skippering boats throughout the Aegean and eastern Mediterranean. Aged 18 he hitchhiked home to England, training as a shipwright at Faversham and later working on Thames sailing barges. Four years later he went back to Greece, where he bought Charmian, his first boat. From here he moved to France. 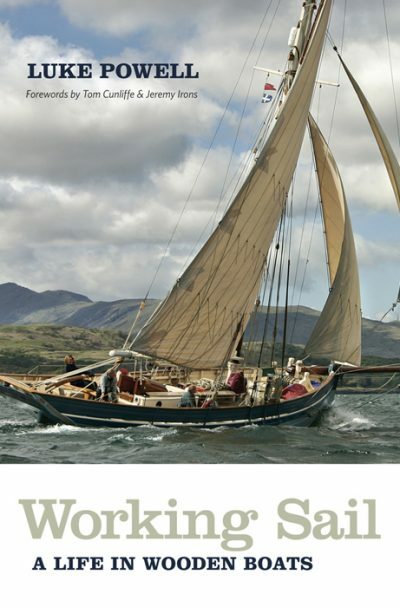 In 1992 he returned to England, setting up Working Sail to build wooden pilot cutters. Today, after building eight cutters, Luke lives with his wife Joanna in the small Cornish town of Penryn and runs a charter business based on the second of his boats, Agnes.He is also involved in a project to restore the only surviving Cornish schooner as a way of teaching young men and women new skills.